Ringside are a band from L.A. consisting of singer/songwriter Scott Thomas and actor Balthazar Getty. I first heard them a few years ago while watching DOOM, a horrible movie inspired by the video game of the same name. Regardless, the song really stood out so I did a little research and found out the name of the band and the song. Aside from being featured on DOOM, the song “Struggle” was also featured in a Pontiac commercial. Their self-titled debut album, released in 2005, is a perfect mix of Indie Rock and Electronic beats. Great swinging grooves, howling vocals, and a longing melancholy flow all throughout. 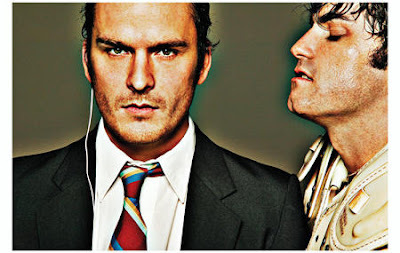 During an appearance on Jimmy Kimmel, Balthazar Getty said he and Thomas were recording a new album due out sometime in 2008. Here we are a year later and still no album! On the bright side, they did post a video for a new song off the upcoming release called “Money”, which I liked very much. It definitely has a bit more of an edge than their previous work, reminding me at times of the Dandy’s or the rockier side of Primal Scream. I’ve added that video and the mp3 for the song “Struggle”. Keep an ear out for these guys, good things are coming… I’m sure!